United States Dental Market is a multi Billion Dollar Industry. The dental market of United States is growing due to various factors, including favorable demographic trends, technological advancement and rising awareness regarding the importance of oral hygiene. Increase in life expectancy has attributed to the growth of the geriatric population in the region which is highly susceptible for oral problems like tooth decay and gum disorders, which would further augment the growth of USA Dental Market. Furthermore, increasing demand for cosmetic dentistry in the region also expected to boost dental market positively in the following years. United States Dental Market is expected to surpass US$ 28 Billion by the year 2025. 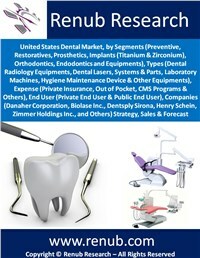 Renub Research report titled “United States Dental Market, by Segments (Preventive, Restoratives, Prosthetics, Implants (Titanium & Zirconium), Orthodontics, Endodontics and Equipments), Types (Dental Radiology Equipments, Dental Lasers, Systems & Parts, Laboratory Machines, Hygiene Maintenance Device & Other Equipments), Expense (Private Insurance, Out of Pocket, CMS Programs & Others), End User (Private End User & Public End User), Companies (Danaher Corporation, Biolase Inc., Dentsply Sirona, Henry Schein, Zimmer Holdings Inc., and Others) Strategy, Sales & Forecast” provides a complete analysis of the fast–evolving, high–growth US Dental Market. There are seven segments which have been studied thoroughly in this report; namely Preventive, Restoratives, Prosthetics, Implants, Orthodontics, Endodontics and Equipments. It is found that Preventive, Prosthetics, Restorative, Equipments and Implant together holds considerable market share of the United States Dental Market. There are four segments which have been studied thoroughly in this report; namely Private Insurance, Out of Pocket, CMS Programs, and Others. Of which; Private Insurance & Out of Pocket hold Considerable Market Share. The report studies the US Dental Market from both the Public & Private End User. Danaher Corporation, Biolase Inc., Dentsply Sirona, Henry Schein and Zimmer Holdings Inc are some of the top companies that deal efficiently in United States dental business. These companies have been studied thoroughly in the report.